James Hoagland is in the business of wigs. 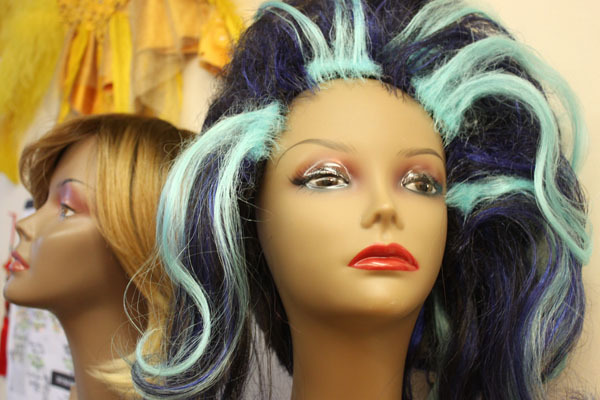 Not just your ordinary costume and fashion wigs – his are specifically for drag queens. He spends hours styling hair and stitching it into wig caps. Last year, he sold 300 mostly to clients in the Lower 48 and internationally. Hoagland does it all from a little studio in Juneau. 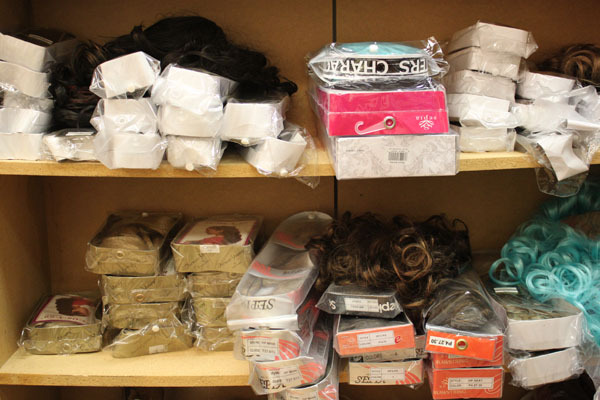 This is a small sample of the wigs James Hoagland offers. “The best wig name is Sandy Pecan Avalanche, which is exactly what you’d imagine it to look like,” Hoagland said. Despite such enticing names, most of Hoagland’s business is custom. On this day he’s re-creating Elsa’s hair from the Disney movie “Frozen.” Usually, for character wigs, Hoagland has a picture to work off of, but he doesn’t need one in this case. 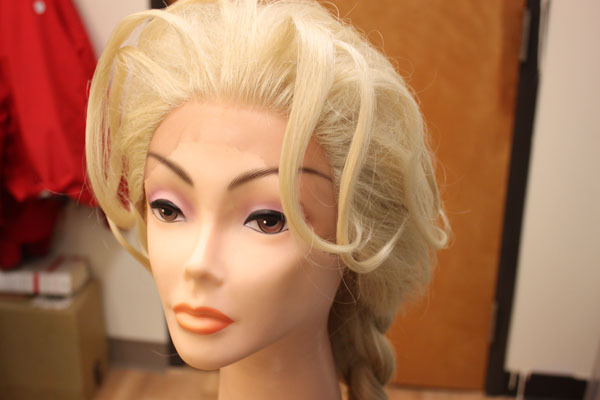 He’s already made eight other Elsa wigs. “One thing with drag queens is they’re very tied to pop culture and their shows are better when they are doing the latest song or the latest character from the hit movie,” he said. Hoagland starts off with a manufactured blond wig about three feet long. It cost him about $30 and when he’s done styling it, he’ll sell it for $120. “The wig will make or break you. It really will,” he said, laughing. People watching drag queens are drawn to the face. The next focal point, Hoagland says, is the hair. “If your wig looks horrible, people really won’t be able to focus on anything else, they’ll be staring at your ugly wig,” he said. The reason that Hoagland knows so much about the drag queen business is because he is a drag queen. He’s not performing now but he spent 8 years touring the county singing in night clubs, casinos and theaters. He found stable work as a Liza Minelli impersonator. His drag name is Gigi Monroe, which is also the name of his wig business. Hoagland says the very nature of being a drag queen is a paradox. Hoagland started his wig business the summer of 2013 on a cruise ship. He was a costume designer for Norwegian Cruise Lines on the Alaska route. He was interested in earning extra money and experimented with making a wig, something he’d gotten adept at as a queen. After he made one, he put it online. “It sold in, like, three minutes,” Hoagland said. So he kept at it, trying different styles and putting all the wigs on Facebook. “I had a network of 5,000 drag queen friends from all over the world,” Hoagland said. Because of cruise ship employee rules, like not taking things off the ship, Hoagland kept his wig business under the radar; he didn’t want people to think he was stealing. He received packages of hair in Seattle and mailed wigs out in Skagway. “I would sneak them off the ship in these bags and I would have my friends who were dancers on the ship carry some of them and it was just hilarious and it was so much fun,” he said. Hoagland ended up making 50 wigs. As he was doing that on the ship, off the ship, he was falling in love. He met his partner while in port in Juneau and had a date every time he returned. They would meet up for dinner, have coffee. “We went on hikes, we went to the ice caves, just kind of got to know each other and he was really what I was looking for in a lot of ways,” he said. Hoagland says his wig business allowed him to take some risks – on a relationship and on Juneau. So far, they’re both working out. The secret to good drag queen hair is height, and more height. Hoagland says wigs for men just have to be bigger. Makeup and body curves should also be emphasized. “Whereas you down play things like shoulders and hands and feet or height, things that make people look more masculine,” Hoagland said. Making big hair takes teasing and lots of hairspray – Extra Super Hold Aqua Net. “This is like my light hairspray. The real stuff is the freezing spray. That stuff is like cement in an aerosol format,” he said. The teasing creates a nest of knots that you can’t see. Hoagland says it’s hidden under the pretty part, which in the character Elsa’s case is a long loose braid that falls down around her shoulder. “It’s one of those styles that’s, like, ‘Oh, it’s supposed to look messy,’ but it can’t be messy. It has to look perfect,” he said. For Hoagland, Juneau is perfect. He gets a lot of support from fellow small business owners who are also artists. And the post office treats his packages with extra care. “In some ways, Juneau is the last place on earth you would ever expect a drag queen to be making wigs, but it’s also kind of the perfect place,” he said. Hoagland doesn’t know how long he’ll be making wigs. But he does know, in one way or another, he’ll always be in the business of drag.